Valentine's Day has evolved not only as a celebration for adults, but also for children. There are many fun recipes for kids, such as frosted heart-shaped sugar cookies. We have Valentine Day ideas that include food, gifts, and activities for this special day. History of Valentine's Day: Although observed worldwide on February 14th, the history of Valentines Day is a mystery. Widely believed is the legend of Saint Valentine, a priest who served under Emperor Claudius II during the third century of ancient Rome. The Emperor Claudius II outlawed marriage for young men whom he saw as potential soldiers. He feared that young married men were not as willing soldiers as single young men. Defiant, Saint Valentine continued to perform secret marriages for young couples in love. When Claudius discovered what Saint Valentine had been doing, he ordered him to death. While awaiting his death, Valentine fell in love with a young jailor's daughter. Prior to his death, Saint Valentine wrote this young woman a letter in which he signed "from your Valentine." Valentine was allegedly put to death on February 14th. Legend or not, this romantic heroine has been immortalized by the exchanging of cards and tokens of affection for many centuries. Invite the children of friends and family to create handmade valentines for their loved ones. If your budget is strained, ask each parent to donate items such as glue, construction paper, lace, stickers, old buttons, and scissors. Have an instant camera available for those special valentines for parents, grandparents and caregivers. Don't forget to provide a snack, being creative makes children hungry. Purchase a heart shaped styrofoam form from your local craft store (or cut your own heart from a piece of styrofoam). Have children insert the stick of the lollipops close together into the form, for a colorful and fun centerpiece. Let the children personalize the glass vase with acrylic paints and a loving message. Both adults and children will have fun making coupons for their loved ones, a gift from the heart. Children can give a hug, a promise to do the dishes after dinner (without complaining), or vacuum a grandparents home. Parents can give a hug, an extra story at storytime, staying up an extra hour before bedtime, 2 hour coupon for one on one time with mom and/or dad, or playing a game together. Mom & Dad can gift each other a backrub, a quiet evening alone (or together), a special lunch or dinner together, or a promise to finish a project around the house. There are Easter egg hunts at Easter, why not Valentine hunts on Valentine's Day? Prevent hurt feelings by putting each child's name on 4 or 5 Valentines before you hide them. The kids will enjoy finding them and sharing with their friends. Have an all day theme, hearts. Try some heart shaped pancakes or waffles for breakfast, a grilled sandwich cut into a heart for lunch, and let everyone create their own homemade heart shaped pizza for dinner. 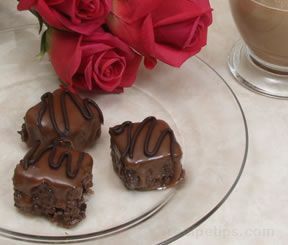 Make Easy Cake Brownies in the shape of hearts for a fun Valentine Day dessert. Candles are synonymous with romance. Purchase several votive and floating candles, place them everywhere. Try floating candles and rose petals in the bathtub and sinks. Never leave candles unattended. Spend the day and early evening hours with the kids, then retreat to your bedroom for the rest of the evening. Create a romantic atmosphere with rose petals, candles, and a romantic movie and/or music. Fun finger food, such as chocolate covered strawberries, matched with a favorite wine is a romantic ending to a perfect day. Have a dessert and sparkling wine celebration. A small gathering in your home with friends and family. Ask everyone to bring their favorite wines and Valentine's Day dessert recipes. Assign each participant a theme and/or a piece of a menu plan. Start with appetizers and sparkling wine at the first home, move on to a first course at the second home, and so on. A designated driver is a must if serving alcoholic beverages. Real life love story. When inviting your guests, have each couple write a romantic or funny real life story of their life together. Read each story aloud to your guests. Have each person give the story a title and guess which couple the story belongs to. Again, you'll get some laughs when each person announces their title and a guess to which couple the true story belongs to. Finish my sentence. How well do your couple friends know each other? Try a simple game of finish my sentence. Before the party begins, create a list of unfinished sentences. Create a different list for female and male guests. First, have the couples complete the sentences with the words they believe their partner would use. When they have finished, give them the other list and ask them to complete the sentences with the words they would use. Make sure to read all their answers aloud, it's the best part! Baby pictures. Have couples give you a baby picture before your gathering, preferably ages newborn to one year old. Assign each picture a number and post the picture on to a bulletin board or cork board. When guests arrive ask them to, first, guess who each person is, and then match the couples. Baby pictures make great conversation pieces and you are guaranteed laughs when the true couples are revealed. It is traditional to give roses to loved ones on Valentines Day. All roses symbolize love, but certain colors take on special meanings. Air drying is a simple way to preserve your roses. Preferably, roses that are just beginning to open, but still have a shape work best. Hang the bouquet upside down with a piece of string in a clean, dry area for up to 2 weeks. Once the roses have dried, create a swag by tying the dried bunch with a ribbon. You could also make potpourri by placing the dried rose petals and leaves in a decorative bowl and adding scented oil. To crystallize your rose petals, place rose petals on a metal rack. Brush the petals with egg whites, then sprinkle with sugar. Allow 7 to 14 days to dry. Both crystallized and dried roses petals will make a beautiful handmade topiary or wreath. "Interesting ideas. I like the Wine and Dessert idea. I will have to see if we can get a few couples to join in. Our friends and family all love wine and who doesn't love dessert!" "Great article! Lots of interesting information and tips for Valentine's Day. I think I will do the Valentine hunt for the kids. They will love it."